The compensation of respiratory movements is one of the most challenging areas of research in radiotherapy. For a safe treatment of mobile tumors their position has to be continuously detected and the treatment beam must be adjusted with a short latency according to the motion. So far, it has not been possible to scan soft tissue in the human body with sufficient accuracy and speed. 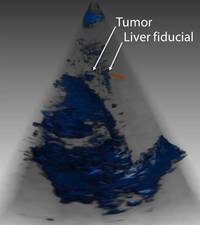 Clinically used methods today use slow, X-ray and marker-based methods for absolute localization of tumor structures. In addition, external surrogate signals are used to estimate the patient breathing state either to turn the treatment beam on and off (gating), or "guess" the internal tumor position by a correlation model and align the radiation beam. Both approaches assume a fixed relationship between surrogate signal and tumor position. Errors in recognition of this relationship, or the change of the model over time lead to treatment errors. In addition, there are areas in the human body, which can not be treated by means of correlation-based motion compensation. Especially in areas of cardiovascular and respiratory movement the tumor motion forms a non-linear combination of these motion sources and the computation of a motion model gets impossible or would require a far too high a number of measurement points (x-rays). With the development of fast 4D ultrasound equipment the visualization of structures inside the human body with sufficient soft tissue contrast and high update rates became possible. Tumor positions can be located in ultrasound volume and used directly for motion compensation. This technology may replace correlation based motion compensation techniques in the near future.